Note: this post is part of a series called #InspiredBy68 in honor of 50 years since the progressive activism of 1968. By any measure 1968 was a watershed moment for American society from Super Bowl II to the Vietnam War’s seeming interminability. As the civil rights movement was transforming our nation, it was about to face its greatest test. Unfortunately, that test came at the end of a gun barrel, and the lives of millions more Americans continued to be shaped by gun violence. On April 4, 1968, Dr. Martin Luther King, Jr. was assassinated and two months later, Robert F Kennedy would also be killed. Fifty years since those fateful days, both King and Kennedy’s deaths remain etched in our nation’s soul and these men are fervently remembered for their leadership and fight for equality and justice. One of the most tragic aspects of their death and that forever grounds them to 1968 and within the broader frame of American history are guns. America’s relationship to guns has played the role of protagonist and antagonist throughout our history. It was “the shot heard around the world” which launched the American revolution. Lin-Manuel Miranda’s Broadway production of Hamilton reminds us that Arron Burr killed Alexander Hamilton in a duel. Presidents Lincoln and Kennedy were killed by assassins, while Ronald Reagan survived being shot in 1981. And if we fast forward to present day, on Valentine’s Day, February 14, 2018, seventeen people were killed by a gunman at Marjory Stoneman Douglas high school in Parkland, Florida. Some of the most important moments in U.S. history have directly or indirectly involved guns. America’s relationship to guns is a complicated one that at the same time is uncanny. Guns are woven into the fabric of what it means to be an American. In America, gun rights are second only to speech and press freedoms. It’s the gun that freed us from the English monarchy, yet it’s the gun that has robbed us of presidents, civil rights leaders and the people we know and love. Five decades ago, King and Kennedy were taken from us too early. The long shadows of their deaths are chilling and haunting. Both were helping turn a nation’s gaze toward the hard truth of our racist past and the deep inequality and racial divisions of the day. They too were working to heal an open and festering wound that we are still dealing with today; not merely because of their historic importance but because in 2018, we have yet to address the issue of guns and their impact on American life. 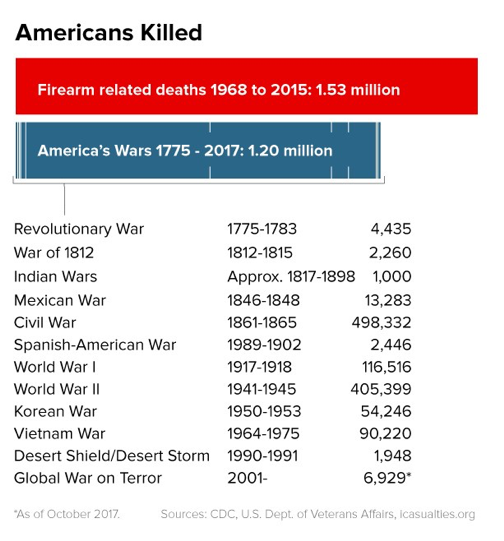 In 2017, NBC News reported that more people have died by guns since 1968 than in all American wars. Approximately 1.2 million American service members have died in every U.S. war compared to 1.5 million Americans who have died in gun-related incidents since 1968. The students of Stoneman Douglas, who have perhaps had the most profound impact on the gun debate in years understand this and have transformed their tragedy into an opportunity to do something. Their activism has ignited a national movement that calls on all of us to take a hard look at America’s relationship with guns. Their activism and the pain they’ve experienced tells us all that we need to know: that it’s time we put greater protections in place to safeguard our schools, churches, public and private spaces, even our homes. The simple truth is that guns wielded by Americans are killing Americans faster than any (foreign) terrorist. As we continue to reflect on all that was 1968, it is a stark reminder that there is much still to reconcile when it comes to our collective past, race in America, and on the matter of guns. As we debate whether citizens should have access to blue prints to fabricate a gun using a 3D-printer, consider this: What would America be like if guns had not robbed us of Abraham Lincoln, John F. Kennedy, Medgar Evers, John Lennon, Malcom X, Martin Luther King, Jr., Harvey Milk, Trayvon Martin, Tupac, the kids of Columbine, Sandy Hook and Stoneman Douglas, and the countless others?